The Society for Growing Australian Plants was founded by Mr. A. J. Swaby of Melbourne. For several years, from May, 1954, Mr. Swaby wrote a column "Know Your Natives" in the popular gardening magazine "Your Garden". Mr. Swaby had a deep conviction that Australian plants deserve a prominent place in Australian horticulture, and these excellent articles attracted a great deal of interest from persons scattered across Australia. The enthusiastic response to his articles inspired in him the idea of forming a society. He announced the idea in the April, 1956, issue of "Your Garden" and he was swamped in a flood of enthusiastic letters from all over Australia. The slogan Mr. Swaby used at this time was "Australians for Australia". In the June 1956 issue, Mr. Swaby envisaged the progress that could be made in taming native plants by intelligent amateurs helping one another, and how desirable it would be to see a chain of such members across the continent. In the September 1956 issue of "Your Garden" Mr. Swaby invited intending members to forward a postal note for 2 shillings to cover preliminary expenses and stated that anyone joining before the end of 1956 would be considered a foundation member. Once again, Mr. Swaby expressed "an earnest desire to help in making 'Australians' more popular in Australian gardens". In December, Mr. Swaby reported: "Applicants to share In the foundation of an association of 'Australian Growers of Australians' exceeded expectations many times over. All States are well represented." Mr. Swaby also announced that a foundation meeting for the purpose of forming an association would be held in Melbourne during March, 1957. The inaugural meeting of the Society was held in the Horticultural Hall, Victoria Street, Melbourne, on 12th March, 1957, at 8 p.m. Over 400 growers rallied to the formation of an association "to be known as 'Australian Growers of Australian Plants'." Growers pledged to promote the establishment and breeding of native plants for garden, park and farm. "The founder, Mr. A. J. Swaby, confessed his early timid hope for 12 members, amazement at 385 before the meeting, certainly for a foundation of over 400 and anticipation of 1,000 in 1958. They came in, not on promises, but threats of work. He hoped that information, not invitation, would be the principle." "At the meeting, nearly 200 people, perfect strangers from three States, under the exhilaration of a common lively interest, moved around and chatted like old friends. Scores of them, from widely scattered places in all parts of Australia, and regrettably unable to attend, sent congratulations." If the name 'Arthur Swaby' is not one that is immediately recognisable, it's probably not surprising. 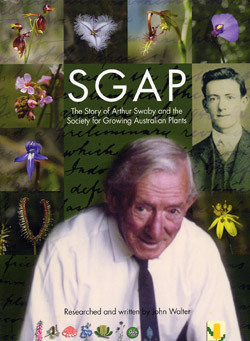 Even the majority of Society members would be unaware of the role Arthur Swaby played 50 years ago in the establishment of the organisation that was to become the Association of Societies for Growing Australian Plants (ASGAP), and subsequently ANPSA. To celebrate the Society's 50th anniversary in 2007, the Society's Victorian Region published a comprehensive history that not only documents the Society's activities since its foundation and Arthur Swaby's role, but also tells the story of the pioneer growers of Australian native plants in the period before the Society was formed. The book has been researched and written by John Walter. Copies of the book (236 pages with illustrations) can be ordered directly from the author, John Walter, 249 Pudding Bag Road, Drummond, Victoria 3461 for $25 each plus $10 postage, Australia wide. Cheques are to be made payable to John Walter. In May, 1957, Mr. Swaby wrote about the handing over of his part as founder to a committee, and he said: "I feel like the proprietor of a one-man business who is passing it over to a public company and has neglected to retain a controlling interest." "What will they do with it? Will it be the co-operative concern of small groups all over Australia, or will it degenerate into mass entertainment in the cities for sentimental admirers, hypnotised by tinted celluloid?" An indication of the spread of membership and interest is shown in his remark that if he could afford it he would be delighted to spend a year or two moving around Australia-from Geraldton to Albany, right across the south, over to Tasmania and zig-zag over eastern States to Cairns and Mt. lsa - just to pop in and meet the friends "Your Garden" has brought. Mr. Swaby was well aware of the special importance of lone members and the small groups scattered in more remote areas away from the cities. He realised that in these places the members were nearest to the task of locating and nearest to the right environment for cultivating desirable, rare or threatened species. He counselled: "The largest groups for some time will be in the cities, but the facility for experimental work and the actual economic and aesthetic need for Australian plants will be in the country. The dry inland areas have the greatest need. Members in the cities are urged to recognise this and to take the responsibility for providing auxiliary work in correspondence, recording, taking up the linking of sections and many other activities which will crowd upon us." Mr. Swaby advised further: "Get your small district groups working on your own lines as soon as possible. They definitely should not be weighted down by machinery of formality......Maintain touch with lone members and with groups in your own region of climate and soil." "Please be prompt in responding to the suggestions (never commands) below and carry on your own individual group projects in your own way until the guidance of our scientific panels becomes effective." "Country - Where possible, establish informal groups of three or more around any centre and appoint a correspondent." "City - Several groups around capitals." "Freedom must prevail for each group and each member." "It must be stressed that this is not a Melbourne concern dictating to adherents elsewhere. We are all learners, each dependent on the other." Newsletter No.4, January 1958 "Council - Counsel (to be read as the thought of a single member seeking a simple reconciliation of freedom and co-operation in relations between regions). It depends, as everything else, in voluntary organisation, on goodwill. A. J. Swaby." "Control, if any, must be democratic. With continental spread, central control would be cumbrous and costly. Not only is it unnecessary, it could destroy unity and goodwill." You may find the early concept of the basis on which regions should be formed thought provoking. "States v. Regions. Several leaders agree that the region of soil and climate is the best basis for working. Regions overlap States and are dotted over them. Fixed notions of State branches should be discouraged. As a temporary expedient, understood as such, it will be very convenient if State capitals take their share of responsibility. We cannot depart far from the conditions where plants are native and expect success. Get your own regional plants in; add those from similar regions." "Regions (suggested by A.J. Swaby after consultation). Borders are not rigid. Subdivision and adjustment should be accepted as strength gathers. Soil and climate will be the fixed basis. Regions centred in capitals will need to help neighbours until they can stand alone." Following the very successful inauguration in Melbourne on 12th March, 1957, groups were quickly formed in other State capitals and some rural areas. Newsletter No.4, January 1958 - "Regions will now take over their own groups and work in their own way." Newsletter No.5, March 1958 - "One year old 12.3.58 and firmly on its feet in every capital, with management in each for wider range and exercise of scientific talent." Newsletter No.7, July 1958 - "Publishing Section takes over. This is our first newsletter as the Australian link." S.G.A.P. Journal No.9, November 1958 - "For postal reasons the newsletter will in future be known as the S.G.A.P. Journal." December, 1959, saw the first issue, Volume 1 Number 1, of Australian Plants (Commonwealth Journal of the Society for Growing Australian Plants). First Federal Conference, 1962, Canberra. Adoption of Federal Constitution, 1965. * ASGAP (Association of Societies for Growing Australian Plants) is now known as ANPSA (Australian Native Plants Society (Australia)).